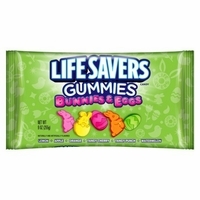 Lifesaver gummy bunnies and eggs. Fruit flavor gummy Easter candy in the shape of Easter Bunnies and Easter Eggs. Let some bunny know you love them with a bag of chewy fruit flavored gummies. Gummy bunnies and eggs come in an assortment of flavors including lemon, apple , orange, tangy cherry, tangy punch and watermelon. Whether you are looking for candy for your Easter Basket, to place in your candy dish or just to eat, you won't go wrong with these fruity little gummy bunnies and eggs.